1 April 1930: Frank Rowlett reports to work for William Friedman. Rowlett was inducted into the NSA/CSS Cryptologic Hall of Honor in 1999 - read the full entry about his career and accomplishments via the link at the end of the page. 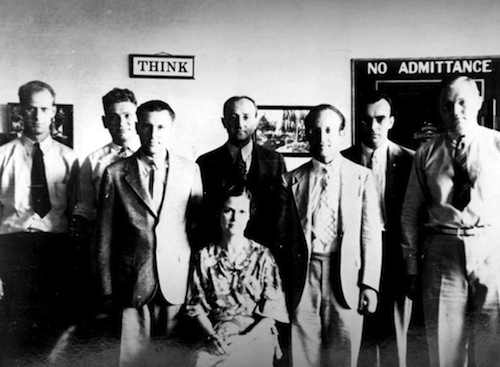 Rowlett & Friedman both appear in this circa 1935 photo with other members of the U.S. Army's Signals Intelligence Service - the first SIS cryptanalysts. The initial four were William Friedman, Frank Rowlett, Abraham Sinkov, and Solomon Kullback. The original members of SIS were a unique quartet, men who ought to be national heroes. Their love was as much for the process as the result, the cryptanalysis as the intelligence derived from it, but what they did, the breakthroughs against the high-level code and cipher systems of our principal enemies, surely shortened the period of war by many months and resulted in the saving of thousands of American and British lives. Rowlett & his colleagues solved the Japanese RED system and Rowlett played a significant role in solving the more sophisticated PURPLE. Rowlett & Friedman went on to help design the SIGABA machine with the U.S. Navy. Because of his importance in the protection of American communications, the NSA's Information Assurance organization has named its highest award the Frank Byron Rowlett Award.